Less than two weeks to go until the highlight of the racing calendar, the Cheltenham Festival. Many punters already have their bets on and with bookies starting to offer non runner no bet those who are yet to strike a bet on the Cheltenham have started to get involved with the guarantee that they will get their money back if their chosen horse does not take part. One of the keys to making money is to take advantage of as many bookie concessions as possible. The bookies know that Cheltenham punters are real punters so they go all out to attract their custom during the four day racing event in the hope that they will continue to bet with the company after the Festival is over. Some of the concessions on offer usually include generous free bets, money back on fallers and refunds if your horse finishes second to the favourite, or another fancied horse. 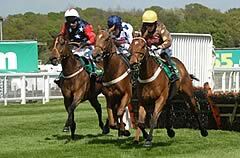 You should expect the Cheltenham Festival 2010 to be no different and shopping around for your bets during the Festival is the strongest bit of advice someone can give. Many punters like to back their ‘bankers’ for the Festival in an accumulator and names being banded about for those sorts of bets this year include Dunguib, Master Minded, Big Bucks and of course Kauto Star, who will no doubt be the main attraction on Gold Cup day as he bids for his third Cheltenham Gold Cup. Of course to make it a very profitable Cheltenham Festival punters will want to back their fair share of big priced winners as well as the bankers and there is no shortage of Cheltenham Festival Tips flying about. Everyone seems to have an opinion but on the above link you can get trusted and respected views on all of the Cheltenham Festival races and hopefully a few winners along the way! Don’t forget the clearer your head, the better punter you are so don’t drink too much Guiness!